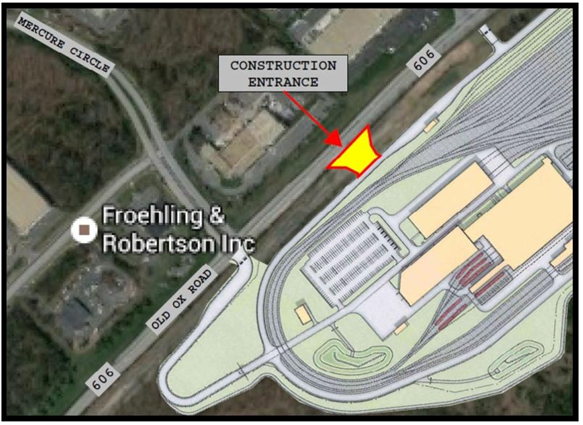 Traffic using Route 606 on the western edge of Dulles Airport and other eastern Loudoun roads may be slower than usual on Saturday, July 16, 2016, because of the delivery of 200 truckloads of concrete to the site of what will be the site of the Dulles Corridor Metrorail Project's future rail yard and maintenance facility being built on Dulles Airport property along Route 606. WHAT: Concrete delivery (200 trucks) and three (3) concrete pump trucks for installation of the Basement Mat Slab at the Service and Inspection Building. WHEN: Saturday July 16, 2016 between the hours of 1:00 a.m. and 3:00 p.m.
HOW: Trucks will travel from the Titan batch plant along Old Ox Road (Rt. 606) to the project site. Titan may use the Leesburg concrete batch plant as an alternate to the Sterling batch plant. Trucks traveling from the Leesburg plant will use the Greenway (Rt. 267) or Evergreen Mills Road (Rt. 621) to Old Ox Road (Rt. 606) to the project site. A 24/7 Hotline is available for Phase 2 Rail Yard construction-related issues: 952-939-6690. For general project information: www.dullesmetro.com or 703-572-0506.